Of all the fishing in the world, one of the best fights you will encounter is that of reeling in a Yellowfin Tuna. The Gulf Coast offers some of the best deep sea fishing anywhere in the world with Venice, La being the crown jewel of Louisiana fishing. One of the true treasures of the area is the year round tuna fishing. These tasty beasts can be caught day or night any month of the year just off the continental shelf around the deep water rigs. By deep water we are talking around 1000ft to about 1500ft deep. To get out of to the rigs to catch yellowfin tuna, you will want to choose a charter who specializes deep sea fishing for yellowfin tuna as they have certain requirements. Many of the veteran fishing guides recommend getting in decent range of a floating drilling platform, or “floater” as is the lingo. There are hundreds of oil and gas platforms in the Gulf of Mexico, many of them reachable by boat for some superb fishing. There are several ways to fish for Yellowfin Tuna, some of them unintentional. Many times when fishing for other species of saltwater fish, such as Marlin and Wahoo, Yellowfin Tuna will hit the bait. So there is a chance you may take home a Yellowfin Tuna even though you were fishing for Wahoo. But, to really experience Yellowfin at its best, the thing to do is an overnight trip to that deep water spot. Night fishing offers a more direct approach to the Yellowfin Tuna. The dark hours bring the fish up from the deep water to feed on the smaller fish at the surface. The smaller fish are attracted by the lights on the floating rigs. This is the time to catch loads of Yellowfin Tuna. Using bait caught earlier that day for a combination of chum and trolling bait, it is time to set up the lines. Many people prefer to drift with the current until a fish bites. This is done by positioning the vessel to float past the rigs while dragging a baited line many yards behind the boat. For the added attraction chum is tossed into the water slowly to draw in more fish. Once you get a bite, prepare for the fight of a lifetime. Landing a large Yellowfin Tuna can take anywhere from 30 minutes to many hours. The Yellowfin Tuna caught in the Gulf of Mexico average around 40lbs to 60lbs. Although 150lb giants have been landed in the past, so be prepared. 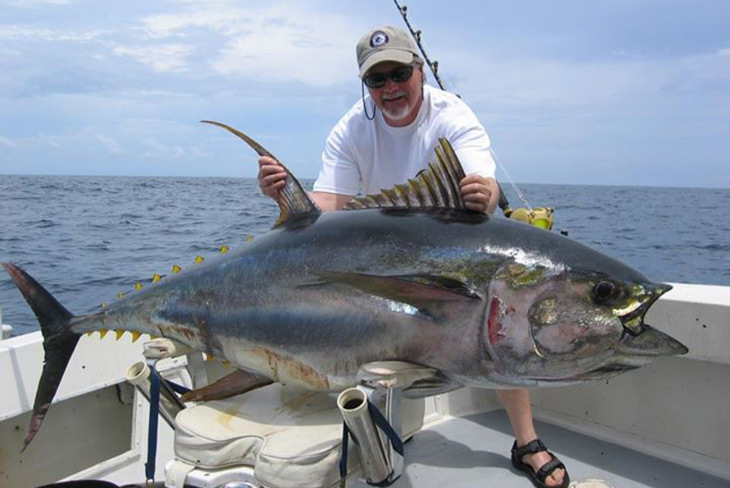 Record sized tuna are out there and ready to be caught on your next Louisiana charter fishing trip. With an average of 40lbs to 60lbs and a local limit of 3 Yellowfin per person per day, a successful trip means there is a lot of tuna to go around. Not including all the other things you may catch like Flounder, Grouper, Snapper, and many more.